IPN, the memorial for the Cemetery of the New Blacks, houses a small gallery of contemporary art. 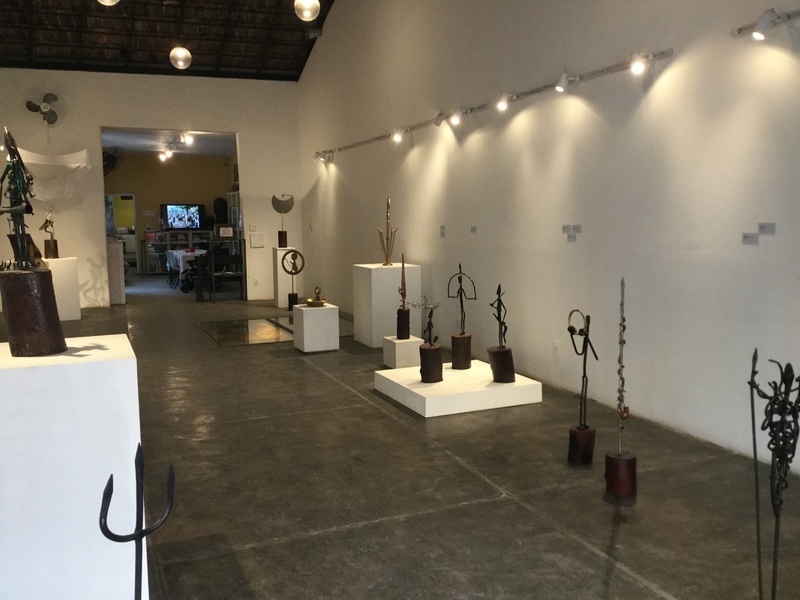 This July 2018 exhibition featured several of the most well-known of the orixás, the divine spiritual entities at the center of traditional African religious practices in Brazil. In Rio de Janeiro, the most commonly known African religious practices are Candomblé and Umbanda, though there are many others practiced here and throughout Brazil. Candomblé is a Brazilian religion that is the result of the forced mixing of various ethnic Africans during the Ma'afa, or Atlantic Slave Trade. Captured Africans were deliberately mixed around with Africans of different nations, ethnic groups and languages. This was a tactic employed by the Portuguese to impede group organization and uprisings. These various Africans mixed together to created new religious practices rooted in their collective African memories, and also invented new ways to address new problems and challenges under the horrific conditions they met in the New World. Umbanda, on the other hand, is of a much more recent emergence, dating back to the early years of the 20th century. Umbanda mixes Candomblé, the Catholic saint system and the Spiritism practices fathered by Allan Kardec in 19th century France. Due to the syncretic nature of traditional African religions in Brazil, it is very difficult to write definitively about the orixás, as there can be great variation from one sect to another, from one region to another, and even from one family lineage to another. In short, the orixás are what I would call the manifestations of the powers of nature. They are the gods who control all aspects of life and death on earth- the wind, the rain, the rivers and lakes and oceans, the hunt and the harvest, disease and health, the plants, the animals, and the creatures of the sea. While there are hundreds of orixás, the most well-known number in the dozens. These traditional practices are strongly associated with the Yoruba traditions, like Jeje and Keto, but can also include practices from Congo-Angola. Differing widely from Abrahamic beliefs (Judaism, Christianity, and Islam), it is important to note that the orixás are inherently powerful without being inherently "good" or "evil". There is no "devil" in traditional African religions because "evil" is not a force nature. Think about water. Water is extremely powerful and absolutely basic to life. Too much water makes a flood, while too little water makes a draught. Floods and draughts are not inherently evil--they have no intentions at all. When water is in balance, good things happen. When water is out of balance, bad things happen. Practitioners serve the orixás with great care for the balance in nature.